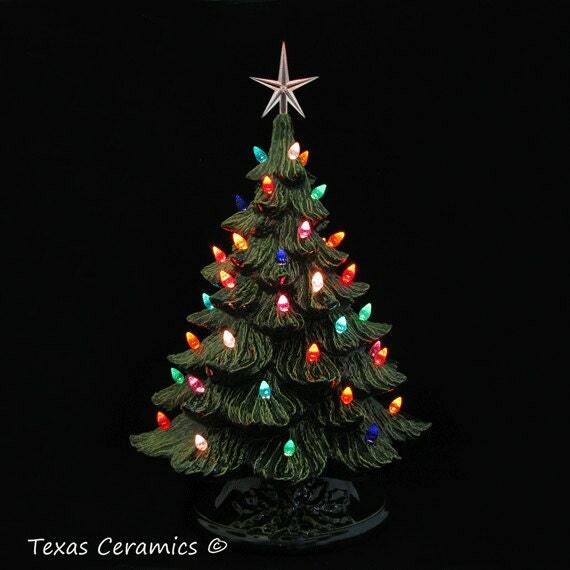 This green ceramic Christmas Tree is just like the trees from years ago made by Mom or Grandma. This ceramic tree is measures 18 inches tall. This tree is electric lighted and decorated with a star at the top and colorful ornament lights that glow when the light is on. I use 9 color of lights in my trees that include red, clear, green, dark blue, aqua, pink, purple, orange and a golden yellow. The lights are secured gently in the tree with water base glue, they can be easily removed. This tree is Made to Order, see processing time in Shipping Section. 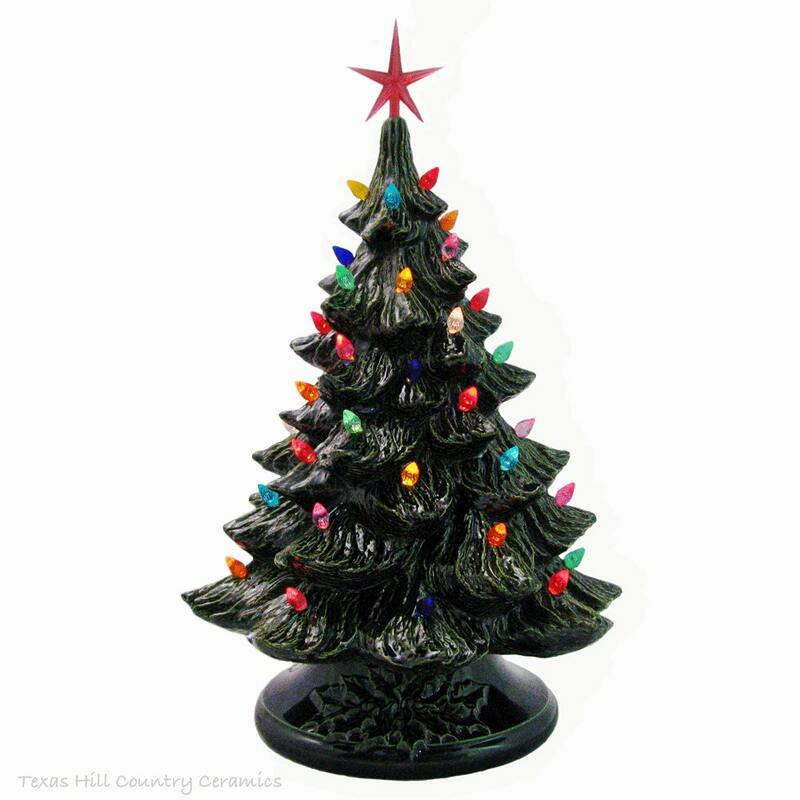 This collectible Christmas tree is brand new but made from a vintage mold.This tall old fashioned Christmas tree is 18 inches tall and is certain to make a great addition to any holiday tree collection. This tree will arrive completely decorated and will save you time, all you have to do is unwrap it and place it on the spot you choose. This green Christmas tree is finished with a non-toxic art glaze, it is kiln fired. The art glaze used on this tree is a glossy glaze and the term 'art glaze' is used to describe a glaze that produces more than a single-colored, smooth finish. The deep green non-toxic glaze produces a lustrous finish and dual coloring. When art glazes are fired in the kiln the glaze flows on the piece building up in the detail giving it more depth and definition, this is the dual coloring effect of the glaze. The lustrous finish creates depth and high-lights at different angles. This Christmas tree is decorated with multicolor flame style twist lights. The lights are glued in place with non-toxic white household glue. The top of the tree is designed to hold a star, you can pick the color star, choose from a red star, clear star or gold star. The base to the tree is finished in a non-toxic green glaze. The base is hand wired with a permanent UL approved light fixture. For convenience a dial switch is on the cord so you can leave the tree plugged in and switch it on whenever you want. The 25 watt torpedo bulb is included. All bases are wired with a UL approved light fixture and plug that is standard for electrical systems used the USA. All light bulbs sent with the tree are for USA electrical systems as well. The total height of this ceramic Christmas tree is 18 inches tall. - the star at the top is 2 ½ inches tall. This tree is even large enough to have a few gifts placed under it. The Christmas tree is 2 separate pieces and easy to put together, just place the tree top on the large base plug it in and switch it on and the tree is up ready to enjoy. This tree is made by hand with the best materials available and with simple care it will last for many, many years. This large tree can be handed down in your family because it will not fade, wear or show age. 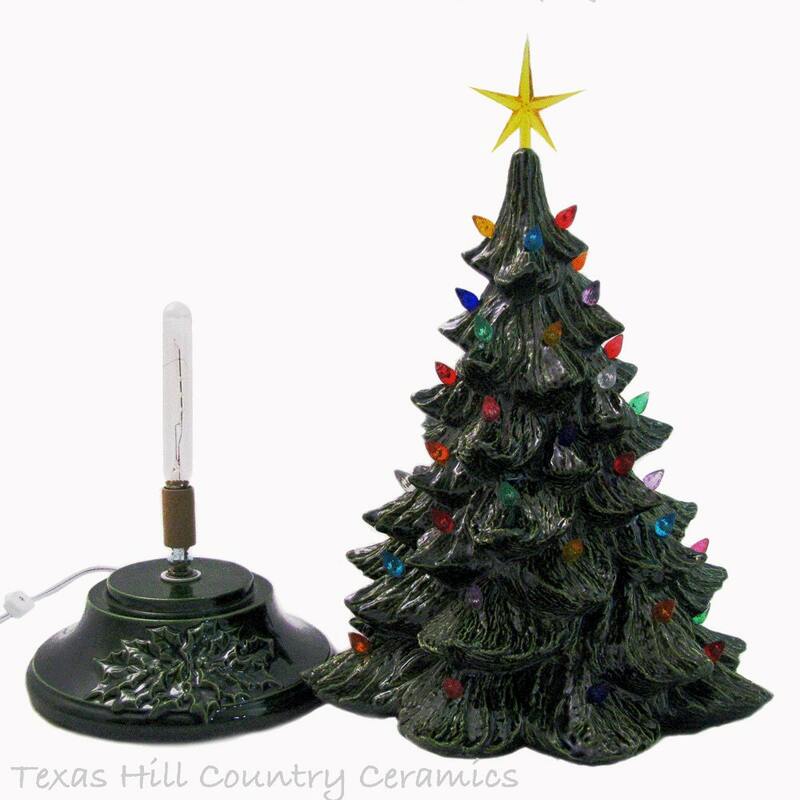 Your ceramic Christmas tree will arrive ready to set up and enjoy and start a tradition for a lifetime. The quality and craftsmanship is beautiful! Detail is pretty! I was excited to get the tree and so pleased when it arrived. Can't wait to display it next year! I'm saving for a white tree! Thank You Jacque! Overall, beautiful ceramic tree. Wait time a little longer then promised. Few lights loosed/not glued. It was worth waiting for. Thank you.